If you’ve read this blog or my books, you know that one of the most significant topics I discuss is using positive affirmations to enhance the quality of your life. If you are not familiar, positive affirmations are positive phrases, messages, or scripture verses you repeat to yourself over and over again. The purpose is that, if your mind hears it enough times, it begins to believe it. For more information about using positive affirmations, I recommend these articles…How to Make Your Affirmations Believable and 7 Excellent Positive Affirmation Tips , along with my free book…The Ease and Keys of Rapid Manifestation. I learned about using positive affirmations from many inspirational authors. These are people who have changed many lives and empowered many people. 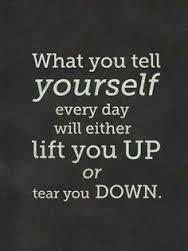 What’s exciting to me, is that I recently found information in the Bible that encourages the use of affirmations and self-talk. Psalm 1:2 says that the blessed man delights on the Law (Word) of the Lord and meditates on it day and night. I researched this information a bit further. I found that the original Hebrew translation says that the blessed man “soliloquizes” on the Word day and night. When I looked up the definition of soliloquy (say that 5 times fast), it is defined as “an utterance or discourse by a person who is talking to himself or herself or is disregardful of or oblivious to any hearers present (often used as a device in drama to disclose a character’s innermost thoughts” (taken from Dictionary.com). In essence, this is what we do when we use positive affirmations. I fully trust the individuals who I learned the idea of positive affirmations from. However, I was encouraged to know that God Himself in His Word recommends using positive self-talk and repetition of His faithful promises to keep our minds pure and empowered, thus enhancing our lives and of the people around us. Those that know me well, or even people who regularly read my articles know that I’m a sucker for positive messages, especially when they come in the form of music. If you were to repeat these affirmations throughout the day, it would be impossible to feel negative and powerless. On the contrary, you will feel positive and powerful. I am so happy I even found this song, and I extremely grateful to our morning musical selector who chooses the music that starts our day. This one should be played until everyone believes it! I have written often about the power of affirmations. If you are not familiar, positive affirmations are simply words and phrases you repeat to yourself to change your beliefs about something. For example, if you are trying to gain confidence, you can repeat an affirmation such as… I am confident in every situation, I can do all things through Christ who strengthens me, etc. Affirmations can be a very powerful tool in creating the beliefs you need to be successful. The problem is that sometimes they can create resistance in the mind, which creates more harm than good. For example, you affirm.. I am extremely wealthy. Then your mind takes you immediately to your almost empty bank account. A voice inside your head says…wealthy? Who are you kidding? You are far from wealthy! Then instead of feeling positive, you actually experience negative thoughts and feelings which pull you further away from your goals. I have written other articles about this (check out How to Avoid the Negative Effects of Positive Affirmations ) which explain how to get around these negative experiences and get the most out of using positive affirmations. I would like to share another excellent piece advice about this I learned while reading an excellent book called “Law of Attraction:The Science of Attracting More of What You Want” by Michael Losier.He suggests using the phrase “I am in the process of…”. When you use this phrase there is no room for negative disagreements to creep up. You are stating a fact. For example, if you are struggling with your weight, using an affirmation “I am at my ideal weight” may create some resistance as you look in the mirror and see the body that you don’t desire. However, if you say “I am in the process of reaching my ideal weight”, you are not saying anything that is not true. Your mind cannot disagree with the fact that you are in this process. In addition, you are placing your focus on your ideal weight. And according to the Law of Attraction, you manifest what you place your focus on. I am a firm believer in the use of positive affirmations to make effective changes in life. I have been using them regularly for several years, and I have seen dramatic changes in my confidence and attitude as a result. Based on some ideas I have been reading lately, I began using an affirmation that is extremely powerful. It goes like this…”I am present”. It’s very easy to remember, and has a positive and powerful effect for two reasons. One component helps maintain focus on the present moment. I have read so much lately of the power of the present moment and putting all of our energies there. Focusing on the present is extremely peaceful and powerful because we are not wasting energy dwelling on the past, and we are not holding back because of worry for the future. This affirmation is helpful in maintaining that present moment focus. Another concept I’ve run into a lot lately (I know it’s because God is purposely revealing it to me) is the power of I Am. In the Bible, God is referred to as I Am on several occasions. I am learning that when we say “I am” about anything, we are essentially referring to the “I Am” that is part of us. Being conscious of that fact has added a great deal of peace and power to my life in the past few months that I have encountered this. This affirmation is a great reminder of the excellent “I Am” power that is part of my being. I am sure that someone else has already used this same affirmation in the same way. However, my discovery of it has empowered me immensely, and I now share it with you. As many times through the days as you can, focus on those words…I am present. As you do, be thankful and engage completely in the present moment. Then focus on the next part and feel the comfort of the “I Am” that is all around you and a part of you. How Can I Use Mind Power For Rapid Manifestation? We all have our goals, don’t we? Hopefully you answered yes to that question. I know from experience that not only do we want our goals and wishes realized, but we want them now. Or at least as quickly as possible. What are the quickest ways to get there? For years I have learned that, through the power of your mind and the power of God, you can go anywhere you want to go. Prayer is certainly a helpful option, and the two ideas I’ve been told consistently are affirmations and creative visualization. I have shared several posts about each, and I can certainly tell you that they are very effective. In case you don’t know, I will provide the crash course here. Affirmations are positive words and phrases you say to yourself over and over again. Creative visualization is using your imagination and playing pictures in your mind of you being the person you want to be and experiencing the life you want to experience. They work well because they affect the subconscious mind, which is the part of your brain makes you the person that you are. In the past I have done these two things separately. I would spend some time stating affirmations, then later times visualizing. However, I have recently discovered an even more effective way to use these tools to manifest my goals even faster. I have found that an effective key is to use affirmations and visualization together at the same time. I will say that I am certainly not a multi-tasker, which is one reason it’s taken me this long to realize the power of this. However, it’s not difficult to do, and if I can do it so can you. Keep your affirmations simple. I have said simple statements, like wealth, God-power, love, joy, etc. Then at the same time, I picture a visual representation. For example, if I say wealth, I spend some time visualizing money. Then I eventually see myself enjoying the benefits of having this wealth and living my life as if I have the exact amount I am looking for. It has a very powerful effect. If you know the Law of Attraction, you know that powerful, positive focus and feelings can only bring you what you are seeking rapidly. Another reason this is effective is because it doesn’t allow the subconscious to question it. Often times when people do affirmations, the mind doesn’t believe it because it has been so negatively conditioned. For example, you can affirm “I am wealthy”, but it is not effective. This is because your mind is then responding, “No I’m not!”. By just saying wealth or power or whatever you are seeking, there is no resistence. Then when you picture it, you start to believe it. That is because your subconscious mind cannot tell the difference between a real or imagined event. Once it is convinced of something, it believes it as truth. That’s how your beliefs are formed, and then you act accordingly. You are currently browsing the archives for the Affirmation category.